Recently I visited Japan. Like other British visitors before me I was struck by the way the long-term approach of the Japanese contrasts with our own short-termism. The Japanese make investments they don’t expect to pay off for ten or twenty years, allowing ideas to be developed fully. They are prepared to back their own convictions, to take risks, to respect and reward the creative input of the people they commission. British design, like the industry it serves, maintains a self-protective, no-risk position. It is no longer exciting or inspiring. With a few honourable exceptions, the main imperative for the bigger design groups and too many of the small ones is financial not creative. The short-term accomplishments of the 1980s design gold rush led to a chronic complacency we could ill afford as we entered the current recession. Recession is a time to take more risks, not fewer, but British designers merely battened down the hatches. Among British designers there is now a sense of impending disaster. It was there even before the collapse of the Michael Peters Group at the end of August after a period of ill-judged global expansion. This mood leads to a lack of conviction and reinforces the inability to plan long term. This in turn creates an industry based on surface effect, where decoration becomes a way of avoiding any real commitment, a way of hedging bets. This is neither evolution nor progression. The protectionism that follows falling share prices drives designers into the arms of the market researchers. Everything must be safe and precisely targeted. There is no longer any potential in the design industry for humanistic thought. The industry no longer represents or deals with what we might term ‘real’ or everyday life. It no longer speaks for or even to the people. When was the last time you heard anyone use the phrase ‘people’? No one talks about people any more, only ‘shares’, ‘turnover’ and ‘target markets’. People are seen solely as digits to be market researched. 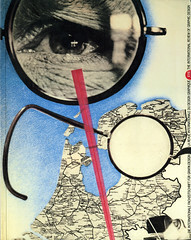 In Europe in the 1920s and 1930s, design was conceived by the pioneers of Modernism as a public service; it was created to facilitate the transmission and understanding of information in a complex society. Obviously this role still exists – society has become more rather than less complex – but it has dwindled in perceived importance next to design’s commercial imperatives, leaving a void at the heart of a once idealistic discipline. It is hardly surprising that the public no longer has any trust in design. Design has failed to capture and hold the popular imagination; it is no longer seen as relevant. Design has become self-centred, obsessed by its own images, while the public has had to tolerate endless redesigns carried out purely as a business investment, as a means of giving form to invisible assets. This is design as packaging rather than content. These days you can even buy a hair gel called ‘Graphic’. What we need now is for design to reconsider its goals and the reasons behind its licence to operate. There has to be a new emphasis on creative risk-taking, on danger; I have not seen any dangerous ideas for a long time. Conveniently forgotten problems need to be addressed and not simply overlooked, or, more cynically still, turned into profit. Design must return to its role of creative pioneering, reflecting social undercurrents and expressing shifts in social consciousness. The current stagnation must be turned into evolution. Design must be made responsible for its actions once again. In its drive for authority and control, design has forgotten one of its most important functions: education, through both entertainment and information. Instead of polluting the environments with false images, with built-in obsolescence, we should be positively encouraging a visual culture that is inspiring and stimulating to independent thought. The only way to achieve this is to work on a smaller scale. Huge overheads and onerous commitments to shareholders and the City mean no creative risk-taking. The important ideas during the next decade will come from small design groups or individuals; the more human scale of these outfits will allow for a more humanistic attitude to design. Small design teams communicate better with each other and more directly to their clients. Clients who have been persuaded they need to commission design giants to spend millions of pounds on their logo, to use market research instead of intuition, to focus on anonymous authority instead of creative friendship, to rely on short-term profit – all these clients need to be re-educated by designers into thinking on a more human scale. We have no choice but to work responsibly towards a protected environment. The time is coming when the squandering of finite resources for commercial profit will no longer be tenable, and designers must start to negotiate this future now. In the last year we have seen the emergence of people power in Eastern Europe – people taking their lives into their own hands. Graphic design, if it is to have any relevance, must become part of this process of change. We need emotion. We need stimulation. We need communication. And we need to live in an environment that reflects the way we live, not the way we are told to live. This essay is based on a talk delivered by Neville Brody at Blueprint magazine’s ‘Graphic Directions’ conference in London in June 1990.